A lot of remedies for acne are for specific acne-prone zones. A certain acne cleanser may work for facial acne only or an acne wash might be just for “bacne,” but an oral treatment can help address it all. Will Jarrow Formulas Skin Optimizer, an oral supplement, be as effective as the best acne creams? We need to know what exactly the pill is made of before we can make a decision about it. Oral treatments for acne are becoming a common choice for a clear complexion because the supplements attack acne at the source of the problem. 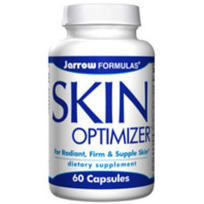 Jarrow Formulas Skin Optimizer is a dietary supplement that should hydrate your skin and promote healthier looking skin. Two capsules a day of Skin Optimizer should help protect the skin and support a better skin tone. The formula is a combination of vitamins and antioxidants that help improve skin condition. Some of the key ingredients include alpha lipoic acid to reduce inflammation, hyaluronic acid to heal wounds as well as encourage normal skin function, and GilSODin to rejuvenate the skin and inhibit oxidative stress. Another important ingredient that gives Skin Optimizer its strength includes the PomGuard Powder Blend, which is primarily pomegranate. Pomegranate has high levels of vitamin C to provide antioxidants. Pomegranate also speeds wound healing to repair skin damage. Skin Optimizer has additional vitamin C to fight free radicals and help with collagen synthesis. Skin Optimizer is a simple supplement, the formula doesn’t try to include eight million vitamins or minerals to revolutionize your life. Instead, Skin Optimizer has basic ingredients that support strong skin. The supplement may not be able to address severe cases of acne, but it can help promote radiant skin for mild to moderate cases. There is no specific time frame for significant results with Skin Optimizer. It might even be best to use a topical treatment in conjunction with Skin Optimizer to help accelerate the healing process.